This was the 50th anniversary of the Consumer Electronics Show (CES), and it was a blast! 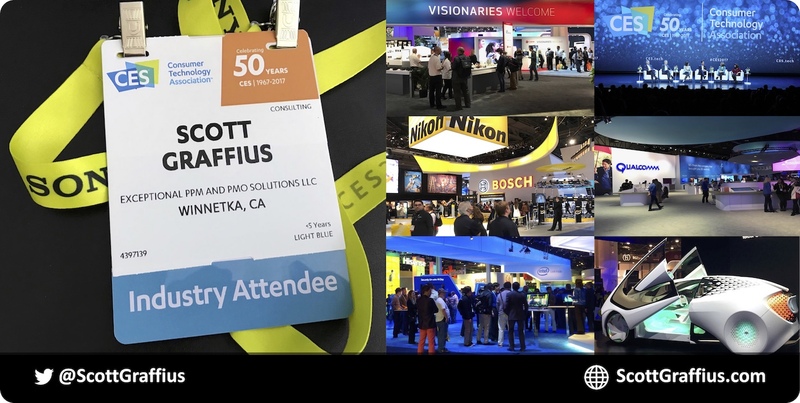 Scott M. Graffius represented Exceptional PPM and PMO Solutions™ at CES. Here are a few highlights. It was a sort of a car show within a tech show. For example, there was Faraday Future’s FF91 — a 1,050 horsepower electric prototype with plenty of smart features. It is reported to go from 0 to 60 MPH in 2.39 seconds. Production is set to start in 2018. Connected cars were a big trend. And the companies working behind the scenes — on features such as autonomous driving and voice-assist — shared the focus. Nvidia is working on technology that would enable cars to read your lips. Mobileye's cameras help cars get a sense of what is happening all around them. Beyond cars, the Internet of Things (IoT) was present with connected products such as washing machines, coffee makers, and more. And there was coverage on wearables and VR.